Why i like Shake Reduction. I have been using Pentax 35mm SLR and DSLR for a long time when i bought my K20D, i didn’t care much about the Shake Reduction (SR) system. The advantage of in-body image stabilization is that all lenses are stabilized, even my old Takumar (M42) lenses ! I learned to like SR by using it more and more, sure i prefer to use a sturdy tripod as often as i can but there is time when a tripod is not practical. I do a lot of frog photography, the lens i use the most often is my DFA 100mm Macro WR handheld and i crawl on the ground to have a frog eye’s view, so SR is handy for that kind of shots. If my shutter speed is very slow i use a ziploc bag filled with sand to stabilize the lens to help SR, i was able to shoot at very slow shutter speeds with this technique. I also use lenses from my 14mm up to my 100mm Macro lens for taking frog shots handheld. I don’t use SR often with my 400mm lens (about 8.3 pounds of glass and metal), i prefer to use it on a tripod. I think it’s even useful with wide angle lenses when i want to go very low to the ground when i want to show frogs, mushrooms and flowers in their habitat. I certainly got photos that i wouldn’t have been able to get with a tripod because i needed to get in a position where it would have been impossible to set-up a tripod. 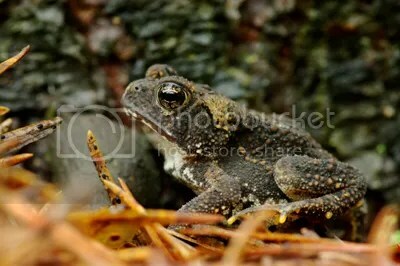 The photo of this young American toad was taken with a Pentax K20D, DFA 100mm Macro WR, ISO 800, 1/5 sec. at f/9.0 handheld with SR and braced on a small bean bag. First post on my Blog here, i will regularly post a photo and describe the technique, equipment used and conditions in which it was taken. When i woke-up it was -15°C outside, a good temperature to shoot around rapids of a river! I went to a river close to my home i knew there will be some ice forming on the rocks in the rapids. There was some fog over the river and some ice had formed on the rocks! I took photos with different lenses, from my 14mm to 50-135mm lens, my favorite shot was taken with my 35mm Macro lens directly into the rapids. The rock covered with ice got my attention because it looked like a reptile back (or a Dinosaur back spine). You need a good pair of warm and waterproof rubber boots to go into that cold water. When i was finished shooting my tripod was covered with ice, the lower part of my tripod leg were frozen in ice and couldn’t close them. 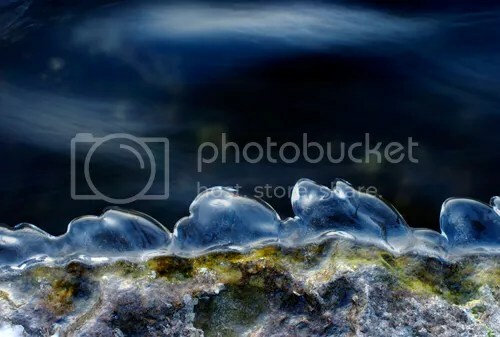 My camera is weather resistant (Pentax K20D) so everything was OK, my lens (Pentax DA 35mm Macro Ltd) is not sealed but the water frozed quickly on cold lenses, i used my nail to remove ice on the lens. The photo was taken with my Pentax K20D, DA35mm Macro Limited, ISO 100, 1.3 sec. at f/16, tripod and Mirror Lock-up (MLU). Since i always shoot in RAW i did some Post Processing in Photoshop, i did use the burn tool on the rock to put back some character to it.